NEW ZEALAND EVENTS: Introducing the ‘Brain Week’ and ‘Brain Day’ events being held throughout New Zealand this coming week. These are for everyone: come along. Events are being held in Queenstown, Gisborne, New Plymouth, Whangarei, Napier Hamilton, Palmerston North, Pukekohe, Tauranga, Invercargill, Wellington, Dunedin and various locations in Auckland (East, West, North Shore and Central). Different towns have events on different days, with Saturday being Brain Day, with a series of events in the major centres. The first event is to be held in Queenstown at 10am on Monday. Please note that the Christchurch and Rangiora events have been cancelled owing to the earthquake. A full list of the events can be found on the Brain Week website. I have to admit the Auckland Brain Day programme (PDF file) looks particularly impressive. It includes our very own Fabiana Kukbe hosting a workshop teaching people How to build your own brain. Dunedin (where I live) will host four lectures with on-going displays outside on the Saturday, at the Castle lecture theatre complex (in the middle of the campus, south of the clock tower building). 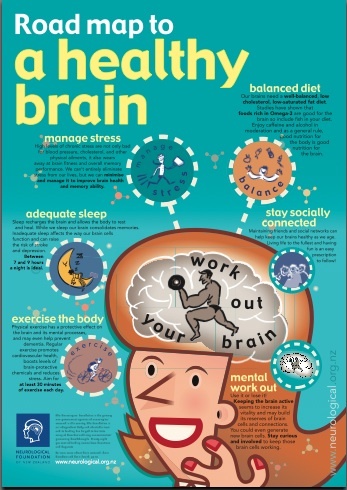 The Brain Week website also has a poster Road map to a healthy brain (PDF file, or click on the image above). These events are brought to the public with the support of the Neurological Foundation and local research institutes.